Years ago, two cousins were visiting near the Okefenokee Swamp in Georgia. Although they were told by their parents not to venture into the swamp, they disobeyed. As the sun was setting, they decided to head home in hopes that their absence would not be detected. Neither boy made it back. When they were found dead a few days later, a note was attached to one of the boys. It read, "I thought I knew the way, but I was wrong." Do you know the way to God? Are you sure you are right? Jesus declared that He is the way to God. He said in John 14:6, "I am the way and the truth and the life. No one comes to the Father except through Me." According to Jesus, if you hope to get to God, you must come through Him. On Lake Geneva in Switzerland, the beautiful castle of Chillon sits on the water's edge with a moat in front and the lake surrounding three sides. 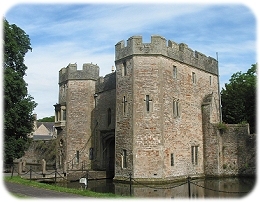 There is only one way to enter in - across the moat bridge and through the huge doors in the front. And one may enter there only if the gate is let down and the door is opened from the inside. Jesus is the bridge let down and the door opened to God. His death on the cross is "the new and living way (Hebrews 10:20)." Peter said, "Salvation is found in no one else, for there is no other name under heaven given to men by which we must be saved (Acts 4:12)." Jesus is the way. Jesus also said, "I am the truth." He is the truth about God. God has told you the truth through His Word, but He did it "in person" through the coming of Jesus Christ. Jesus, who is also called the Word in John 1, is the perfect expression of God (Hebrews 1:1-3). "Anyone who has seen me has seen the Father," Jesus claimed (John 14:9). There are people who believe in a concept of God but only think of Jesus as just another philosopher, though perhaps of a superior quality. The Bible says that Christ came to that which was his own, but his own did not receive Him (John 1:11). Is it possible for people to believe only in God and to dismiss Christ as merely a teacher? Jesus taught that it was impossible to truly believe in the Father without believing in the Son as well. Once He told some religious leaders, "You do not know me or my Father. If you knew me, you would know my Father also (John 8:19)." He also said, "I and the Father are one (John 10:30)." To reject Christ is to reject the Father completely, for they are one in essence. Jesus was worshipped as God, controlled nature as God, forgave sins as God, did miracles as God, and lived perfectly as God. Jesus is the truth about God. Jesus also asserted that He is the life. A friend of mine was once in a serious car accident. He was taken out of the car as dead. When the medics examined him, they said to each other, "This one is gone." My friend could hear them speaking but could not move. He wanted to shout, "Get to work on me. I'm not dead. I'm alive!" But he could not get a word out of his mouth. The Bible teaches that you are worse off than my friend. The Bible says that you are spiritually dead, not just paralyzed (Ephesians 2:1). This is why you need Jesus so badly. He is the life. He can bring life into your dead soul, life that is transforming and exciting for now, and life that will last forever in eternity. John said, "And this is the testimony: God has given us eternal life, and this life is in his Son. He who has the Son has life; he who does not have the Son of God does not have life (1 John 5:11)." We used to hang a colorful picture of heaven and hell in our children's room. It depicted a huge cavern full of fire, representing hell. On one side is a city awaiting destruction. On the other side is heaven. Across the cavern is a huge cross over which some people are walking. The scene is a graphic reminder that Christ is the way to God, and nobody comes to the Father but through Him. It also shows us that the cross is the means by which He has secured a place for sinful people in heaven. Peter said, "For Christ died for sins once for all, the righteous for the unrighteous, to bring you to God (1 Peter 3:18)." You must trust Christ as the only way to the Father. He demands that you depend upon Him alone for your salvation. There are important facts you must believe about Christ, that is true, but ultimately you must put your faith in the person Himself. He is the way and nobody, including you, will get to the Father but through Him. Copyright © 2001 Jim Elliff Permission granted to reproduce in exact form, including copyright information. Other uses require written permission. Christian Communicators Worldwide, 201 Main, Parkville, MO 64152. See our web site at www.CCWonline.org.